The Emmy-nominated Netflix drama The Crown follows the life of Queen Elizabeth II, but unlike the longevity of the real Queen, we have to content ourselves with only two seasons with Claire Foy’s depiction of the royal. It is now Olivia Colman’s turn on the throne, with her duration on the series set to run from seasons three to four. 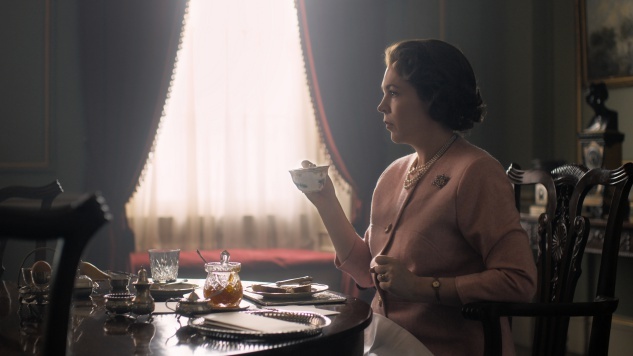 The first image of Olivia Colman as Queen Elizabeth II was released Monday, and in characteristically British fashion, she is seated at the breakfast table holding a cup of tea. Garbed in a structured, pastel-pink outfit, Elizabeth is depicted both in a style of socially expected demure femininity and politically expected strength and formality. Unlike Foy’s cool stare capturing the Queen’s flinty demeanor, Colman’s gaze, at least in this photo, is softer, though indecipherable; she could be looking down the table at her husband Prince Philip or be seated alone, but her clenched fist suggests tenseness in the room, further knowledge of which we yet are not privy to. In a statement released on the show’s Twitter, Colman praised The Crown’s enthralling narrative and shared her excitement to join the cast of the show’s next phase. “I think Claire Foy is an absolute genius. She’s an incredibly hard act to follow,” Colman said. The series is expected to last six seasons and as it moves into its third season, it is also shifting into its second “phase.” Since the series is set to journey through the entirety of the Queen’s life, and with each season thus far covering an approximately ten-year time span, the creators have planned to rotate out its cast after periods of two seasons in order to maintain accuracy between the age of the characters and their casted counterparts. The new rotation of cast will also feature Helena Bonham Carter as the strong-willed and freethinking Princess Margaret and Tobias Menzies, of STARZ’s Outlander and HBO’s Game of Thrones, as Prince Philip. You can catch up on the first two seasons of The Crown out now on Netflix and read some of our thoughts on season two here. If you haven’t tried watching this historical drama yet, Paste named the series one of the 25 best TV shows of 2017. Get a taste of the series with the season one trailer below to see what you’ve been missing out on.